The Comfrey/ Arrowroot Challenge: Which is most productive in the subtropics? Sweet spring: Do you find that when you are picking certain seasonal plants from your garden that life somehow seems sweeter? Right now, my winter sown chervil and watercress have such soft, juicy, delicate, fresh growth in my garden they are a delight to handle. I grew up with these two crops, there always seemed plenty in my grandparents London garden. Like mint, they escaped from positions dedicated to their cultivation and their seed found its way into all the nooks where they were happy to grow themselves. All we needed to do was pick and enjoy them. Culinary bliss! Cold damage on tropical plants is often slow to surface. I’ve spent about four days this month trimming and pruning back tender plants that were damaged by a wintry East Coast Low weather system last month. The Mexican tree spinach (Cnidoscolus aconitifolius) entirely defoliated, and the Pandan (Pandanus amaryllifolius) has yellowed and many leaves are unuseable. Chilli fruit stopped swelling, my numerous ‘Piri Piri’ chillies are tiny, like red dots. The cool really suited my annual nettles (Urtica urens) which made nettle soup, I’ve got one bag full of Arrowroot (Canna edulis) rhizomes waiting to be cooked. The mild-flavoured Chilli ‘Corno di Toro’ (bull’s horn) made a mouthwatering chilli jam which only lasted a fortnight before it was all eaten. Pigeon pea (Cajanus cajan) have been late, I’ll pick them later this week after filming with Gardening Australia. 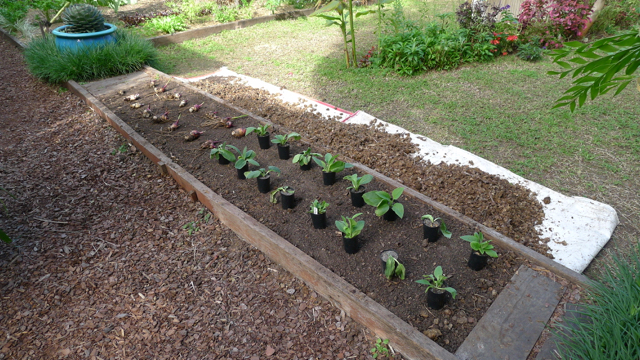 In this garden I grow Queensland arrowroot (Canna edulis) for mulching and compost making because it grows so reliably. So many visitors have asked why I don’t grow Comfrey (Symphytum x uplandicum) for compost-making and mulching. I guess the reason is because Comfrey, a cool climate perennial, has been popularised by northern hemisphere gardeners who cannot grow a decent crop of Canna edulis, a warm climate perennial. So I cleared a bed where I will trial equal plantings of both. Over the spring to autumn growing season I hope to demonstrate which species – either Comfrey or Queensland Arrowroot – uses the least amount of water to grow successfully, and which produces the greatest amount of organic matter. I dug the bed over, working in well-rotted horse manure into the top soil. After planting, I mulched the surface with layer of Sugar Palm flowers (Arenga pinnata). This palm bloomed in autumn and left a pile of fallen flowers big enough to fill three wheelbarrows. The trial bed is pictured, above. The Stinking Roger are tall, delicate and flowering their hearts out. Time to make ocopa with huacatay sauce! ← Meet Brigalow, a national Treasure. I always like to read what you are planting next . I am harvesting great lettuce , spinage , radishes and soon peas. Will sow Cucumbers today, before the rain arrives I hope. I have about 15 Persimmon seeds sprouting from our ex garden and one is already 2 feet high a lovely shaped tree but non have lost their leaves as yet. Hmm except 2 about 6″ tall ones. I grew the original 2 Persimmon trees from seed in Sydney 20years ago , all bore beautiful fruit. Had to leave them behind when we moved a few month ago, but I collected seeds and now have these young tiny trees . In the past I have mainly used a compost derived chiefly from the leaf drop of an old liquid amber tree but was running short and bought the mix. I think I bought four 25 litre bags. * To fill a hole where I removed soil after a tradesman spilt what he said was paint and the soil smelt strongly of mineral turps. For the bottom of the hole I used natural clay from the cats kitty litter and put the native plant mix on top. * To mix with the very heavy clay soil that seems to be the dominate soil in the new place I have recently purchased. I have mixed in the bagged soil when planting the area with indigenous plants from the local council nursery. I have also used an organic tea tree product which is a by-product of making tea tree oil to mix in with the heavy clay. At this point the mix is well and truly integrated with the existing soil so I would have to accept that any damage is already done, however, I would welcome any comment or advice.